Diamond bruting wheel show good grinding and polishing and abrasive machining performance in grinding and polishing of natural diamond bruting, tungsten carbide tools grinding applications. 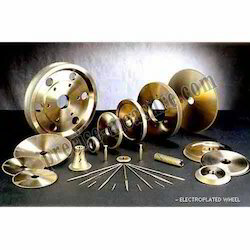 We offers Electroplated Diamond Wheels. Keeping in mind the precise requirements of the clients, we manufacture and supply quality approved range of Electroplated Diamond Wheels that are appreciated for optimum quality and durable standards. Offered product range is corrosion resistant in nature and is utilized in different industrial applications. Moreover, we offer the entire product range with customized solutions. - Better surface finish etc. 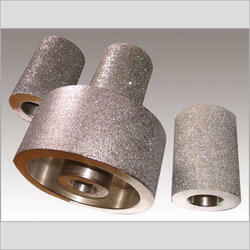 in grinding sintered carbide, glass, ceramics, ferrite and other hard metals. We are providing to our respected patrons a supreme quality range of Electro Deposited Diamond Wheel. These wheels are made of premium quality imported material to make sure extended tool life and are provided generally in varied specifications. We have developed a wide range of Industrial Diamond Cutting Tools for the following materials. Our Cutoff wheel is available at reasonable rates and is offered in customized specifications. Under the supervision of our experienced professionals, we are providing high quality range of Diamond Electroplated Wheel.